The editors of The Washington Post are of course entitled to their own opinion; except this spin from the political appointees at the IRS was flatly contradicted by the Inspector General charged with actually investigating these matters for the Treasury. 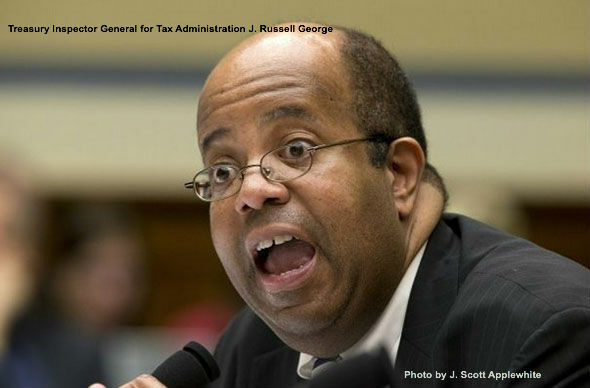 J. Russell George, the Treasury Department's Inspector General for tax administration (TIGTA) and author of the May 14 TIGTA report on Tea Party targeting by the IRS, sent a letter dated before the Washington Post editorial to Congressman Sander Levin (D-MI) in which he stated, "Our audit did not find evidence that the IRS used the ‘progressive’ identifier as selection criteria for potential political cases between May 2010 and May 2012." Breitbart News reported that in Inspector General George’s analysis, "In total, 30 percent of the organizations we identified with the words 'progress' or 'progressive' in their names were processed as potential political cases. In comparison, our audit found that 100 percent of the tax-exempt applications with 'Tea Party,' 'Patriots,' or '9/12' in their names were processed as potential political cases during the timeframe of our audit." The Inspector General found “that 100 percent of the tax-exempt applications with 'Tea Party,' 'Patriots,' or '9/12' in their names were processed as potential political cases during the timeframe of our audit." Not a few, not some along with other potentially political sounding names like “occupy” or “progressive,” but all of them. According to reporting by Brietbart’s Michael Patrick Leahy, “George found that during the two year period he studied between May 2010 and May 2012, 20 groups with the 'progressives' identifier filed for tax exempt status with the IRS. Of these 20, only six were flagged for inclusion in the group of 296 applications identified as potential political cases." Of these six, the IRS moved none from the "potential" category to be processed as political cases. Processing an application as a political case means that the IRS believes there is evidence the group was engaged predominantly in political campaign activity and therefore not eligible for 501(c)(3) tax exempt status. In contrast, Leahy found, 96 groups with the identifiers "Tea Party," "patriots," and "9/12" applied for tax exempt status during the same time period. All 96 were flagged as potential political cases. The TIGTA report did not provide exact details of the number of these 96 cases that were processed as political cases. However, they comprised about one-third of the 296 applications classified as potential political cases. Of these 296, 69% were processed by the IRS as political cases. Democrats have attempted to undermine Inspector General George's report by claiming he failed to address purported IRS targeting of progressive groups. Yet George's letter to Representative Levin makes it clear that no such targeting comparable to what conservative groups were subjected to took place. The Washington Post is aiding and abetting the Obama administration’s cover-up of the targeting of conservatives by the IRS when it fails to use its much-vaunted investigative desk to actually investigate the Chicago-style political targeting that has been going at the IRS (and other agencies of the federal government, such as the EPA). Instead, WaPo simply buys the talking points put out by congressional Democrats and the Obama political appointees who are themselves at the very heart of this scandal.